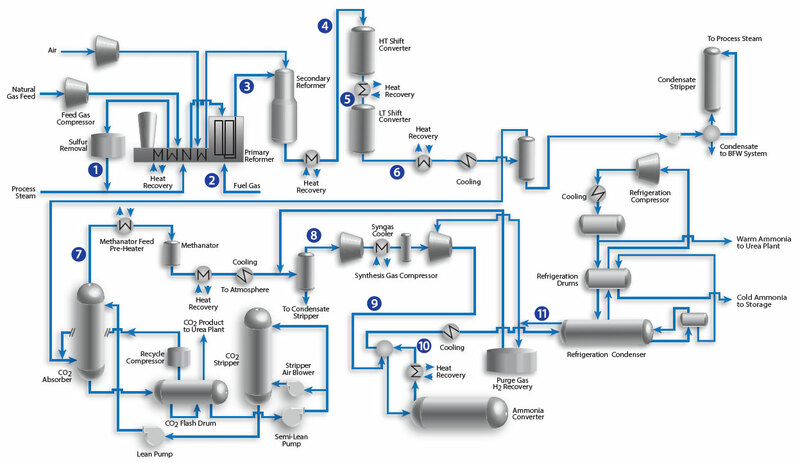 In a typical ammonia producing plant using natural gas feedstock, a Steam Methane Reformer (SMR) is used to convert the natural gas to syngas, which is a mixture of mostly H2 and CO. The CO is then converted into additional H2 and CO2 using Water-Shift (WS) reactors. Subsequent syngas processing purifies the syngas by removing the CO2 via a CO2 absorber followed by the methanation of any remaining CO2 (which is a poison for the catalyst used to synthesize NH3). The N2 from an air separation unit is combined with the H2 and reacted via the Haber-Bosch process in an ammonia conversion reactor. There are several streams that are typically analyzed in real-time for control and optimization of the main process units. However these streams can present challenges to traditional gas analyzers. The Optograf™ Analyzer offers a robust solution for these challenging streams. A table of downloadable application notes will appear if you rotate your device to landscape mode.